This poem has been modernised by J. R. R. Tolkien in such a way that it keeps all the delicacy and atmosphere of the original mediaeval poem. At some point in or around early 1936 Tolkien had offered his translation of this poem to the London publisher J.M. Dent for publication but was rejected. However, Guy Pocock, who joined the BBC in 1936, saw it and recommended that the translation would make a good radio programme (see Tolkien Chronology, pp. 193, 199). Tolkien’s translation of “Pearl” wasn’t published until 1975, two years posthumously, together with his translations of Sir Gawain and the Greek Knight and Sir Orfeo. What I find fascinating is perusing the programmes preceding Tolkien’s ‘Pearl’ – one can imagine Tolkien tuning in to hear his own translation being read out, and perhaps catching some of the programming around it. That particular Friday, the programme earlier that evening included a recording of a speech by Lord Baden Powell, the founder of the Scout Movement, from what is described as the “International Boy Scouts’ Jamboree”, which, however, must be the Northern Counties Jamboree, at Raby Castle, near Staindrop, County Durham. I speculated in my 2008 monograph that Tolkien was at least familiar with scouting principles and learning, but we now know that he and his brother, Hillary, were definitely involved in the movement, having started three patrols of scouts at the Birmingham Oratory. I wonder whether Tolkien would have listened to Lord Baden Powell’s speech that evening, while waiting to listen to the broadcast of his translation of ‘Pearl’! Following Tolkien’s seminal 1936 lecture “Beowulf: The Monsters and the Critics”, C.V. Salmon of the BBC wrote to Tolkien to discuss the possibility of “a broadcast on Beowulf with a reading in the original Old English” (Tolkien Chronology, p. 220). 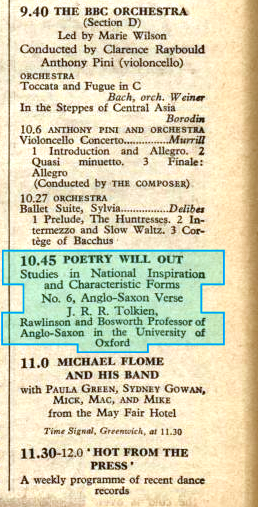 This led to a very short talk which was broadcast on 14 January 1938, as part of a series of short programmes titled “Poetry Will Out”, subtitled: “Studies in National Inspiration and Characteristic Forms” (Radio Times, 14 Jan 1938). Later Tolkien enlarged this talk, parts of which Christopher Tolkien edited and published as an Appendix to The Fall of Arthur (2013), under the title “Old English Verse”. The idea of this series is that poetry is to be found in the hearts of all peoples, although among different peoples it takes different forms. Some of these forms-the French sonnet, Scandinavian sagas, Italian epics, and so forth – are traced in this series. Let’s hope that the Genome Project will continue to digitize old Radio Times issues – let’s see what else we can discover about Tolkien’s BBC links!